A good smoke detectors can save your life! Smoke Detectors can save your life! All houses built in the last 30 years are required to have a smoke detectors. 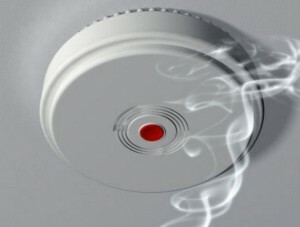 Smoke detectors only have a life span of 10 years till they need to be replaced. Some alarm companies also install smoke detectors that are tied into a reporting communication center. If you have an older home, or your smoke detectors are over 10 years old, you might want to consider replacing and or upgrading your smoke detector. Did you know that you only have as little as 3 minutes to get out of your house if it’s on fire! There are two types of smoke detectors: ionization and photoelectric. Each type uses a completely different technology to detect a house fire, so which one is best for you home? There are now units that have dual technology alarms. These units are most effective with a smoldering fires; which, are the most common in homes. It works by looking for smoke particles between two optical sensors (transmitter and receiver). When the “signal strength of the optic sensor starts to drop, that is or means there is smoke particles between the two sensors, it alarms. This type of unit employs a small amount of radioactive material to detect smoke particles; much the same way as the photoelectric detectors work. They work best with flame fires with limited smoke. 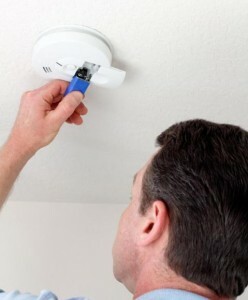 As stated by the professionals any smoke detector is better than none at all. However they are now leaning toward the dual version of smoke alarms. Change the battery once per year! You can certainly purchase your own but Hill electric can select the new approved detectors for your home and install them so you can rest easy knowing you have the latest in life saving smoke detector(s). Only a qualified electrician can install a smoke detector. Where do you install a smoke detector? Test your smoke detectors once a month! Once a month you should push the little red button or test button on your detectors. You can do this on the first of every month for easy memory. You should also replace your batteries once a year or follow the manufactures suggestions about battery replacement. Qualified electricians: desert power issues. LED light bulbs vs CFL lights where LEDs are great for outdoor lighting too! Get in touch with Hill Electric, Inc. today for all of your electrical and custom lighting needs.